Remount costs include 3-day travel from Daniel Wilfred from Ngukurr in the Northern Territory to Melbourne, as well as accommodation during remount period. Fees are excluding travel, accommodation and per diems (LPA). Venues closer to Melbourne might not always require the Producer to come, reducing the touring party to 4 - at the discretion of the AAO. Hand to Earth developed during an Australia Art Orchestra residency in the remote highlands of Tasmania. 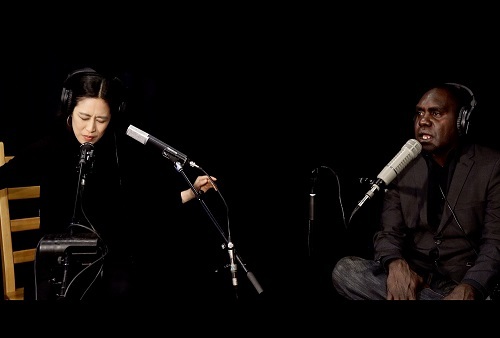 Yolgnu songman, Daniel Wilfred, and Korean vocalist, Sunny Kim, formed an effortless rapport that spans continents and cultures and yet expresses a deeply human commonality. Their vocal approaches are melded into the electronic atmospheres created by trumpeter and composer, Peter Knight, who draws on the minimalism of Brian Eno and Jon Hassell to create a bed for these beautifully contrasting voices. Daniel sings in language and is the keeper of Yolgnu manikay (songs) from North East Arnhem Land that can be traced back for over 40,000 years. His is the oldest continuously practised music tradition in the world. Sunny sings in English and Korean and intones wordless gestures that invoke raw elemental forces. Together they sing of the stars, of fire, and of the cooling rain, against Peter Knight’s floating trumpet notes and electronic crackles. Hand to Earth expresses the here and now in music, and represents contemporary Australia at its best: sophisticated, inclusive, diverse, and forward looking. The AAO celebrates its 25th anniversary this year, and through its long history has developed a great reputation. This will, however, be the first time since long that we tour Victoria. The line-up of Indigenous Australian, Asian-Australian and Western Australian musicians is an important marketing asset, showcasing the incredible ability of Australian society to come together as a community and find a way forward through art. The work is contemporary, but at the same time very accessible. The music triggers the imagination, goes places you haven't gone before, but always is welcoming and inclusive. This is aimed at audiences interested in contemporary music, and audiences interested in Indigenous culture, or a social awareness regarding inclusion and diversity. In regard to contemporary music, the target audience ranges from adults interested in jazz, to audiences that like world music, contemplative electronic music, or minimal classical music. In addition, a target audience would be those interested in Indigenous culture in general, and a special interest in topics like community, inclusion and diversity. With our workshops and talks, we would provide engagement opportunities. We would be offering workshops to diverse groups: primarily, for children and young people to connect to Daniel and have him share his culture and stories through music, participation and conversation. Sunny Kim and Peter Knight would also contribute to the workshops. For adult audiences, we'd also be able to host deeper conversations, about each of the artists' culture, and how music and particularly improvisation overcomes barriers to communicate across cultural and linguistic barriers. We'd also love to engage with local Indigenous communities, in any way that is considered appropriate. 2 x vocal mic, 3 x DI box, console w/ digital effects and graphic EQ on all outputs, 3 stage monitors (wedges), quality full-range FOH speakers appropriate to size of venue and coverage required. 3 musicians, 2 standing 1 sitting to perform, no special staging required other than traps table (or road case, plinth etc) for electronics.